The Falcon’s last loss to a WCHA foe came on 10/31/14 as they were handled by the Minnesota State Maverick’s, 5-2. The Falcons wouldn’t see another loss until 77 days later as they fell to the Michigan Tech Huskies tonight. 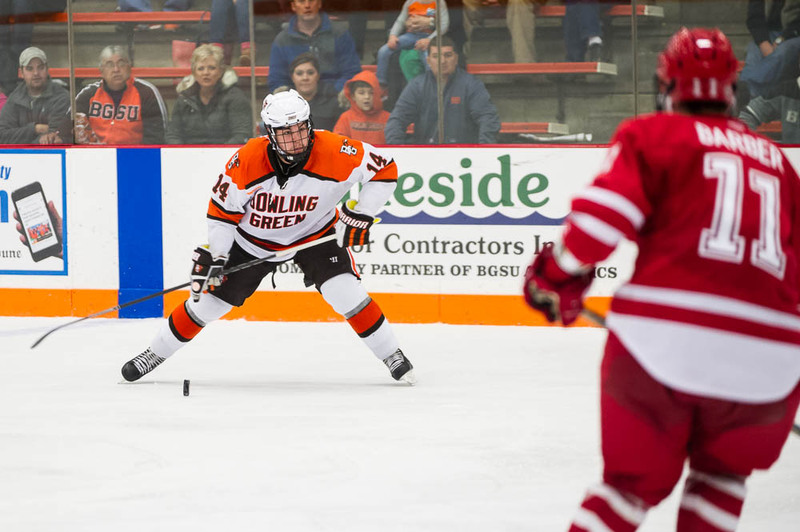 Chris Nell started in net for Bowling Green, stopping 19 of 23 Husky shots. Jamie Phillips started for Michigan Tech and stopped 31 of 34 chances in the winning effort. The scoring opened in the second period as Dan DeSalvo scored his first goal of the season on a rebound by Mark Friedman at 6:27 of the second. Brandon Hawkins stretched the Falcon lead to 2-0 at 14:44 as he wristed a snipe past Phillips. Ben Murphy and Connor Kucera assisted on the play. The Huskies scored their first goal at 16:23 as Alex Petan was left all by himself on the backdoor of the net and re-directed a perfect pass from Chris Leibinger from the far face-off circle. Mark Auk drew the game back to a tie at 18:26 with a missile slap shot from the blue line. It appeared the Falcon’s had the game in hand as they scored their third goal at 6:30 of the third period. Mitchell McLain cleaned up a rebound by Dajon Mingo for his fifth goal of the season. But, the Huskies reeled off two goals within 2½ minutes of each other as Brent Baitus scored at 7:52. The Huskies scored the game-winning goal at 10:19 on the power play as Tanner Kero scored a goal with Mike Sullivan in the penalty box for hooking. The Falcons had chances at the end of the game with an empty net but weren’t able to make it two games in a row with a late comeback. The Falcons and Huskies will complete their series Saturday at 5:07pm.